England’s second World Cup qualifier of the week came with a trip away to Bosnia & Herzegovina. After the frustration of drawing with Wales on Friday night, the Lionesses would have wanted to come away from their travels with nothing less than three points; three points that would take them to the top of Group 1. However, they knew that another test would await as Bosnia would inevitably put 10 players behind the ball. This is exactly what they had done when England visited in 2016. Then, they had only edged to victory with an 87th minute goal. There was a minor blow for Phil Neville in the build-up as Fran Kirby and Demi Stokes had to withdraw through injury and illness respectively. However, the England manager opted not to call up any replacements to his squad ahead of their trip to the south-east of Europe. The venue for the game was Zenica, right in the centre of the country. Bosnia is not the easiest place to get to, with no direct flights going out of England. Zenica itself is about an hour’s drive from the capital, Sarajevo, but is situated in one of the most beautiful locations. Surrounded by mountains and on a hill overlooking the Arena Gradska, there probably aren’t many prettier places to play football. Neville announced five changes to his starting line-up from the game against Wales. Alex Greenwood replaced Demi Stokes at left back, while Jade Moore and Izzy Christiansen came in for Keira Walsh and Fran Kirby. After impressive performances as substitutes on Friday night, Mel Lawley and Ellen White started instead of Nikita Parris and Jodie Taylor. As predicted, Bosnia-Herzegovina lined up in a 5-4-1 formation. 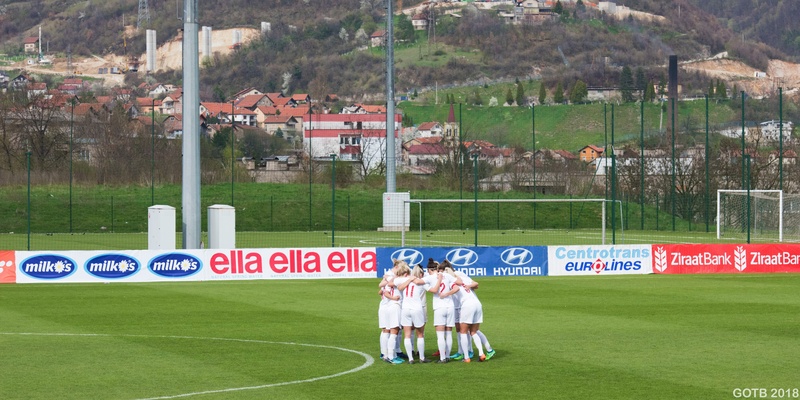 Their captain, Milena Nikolić, was set up as their lone striker but was predicted to drop back into the midfield for most the game. The first half went pretty much as expected with England dominating the ball. They started well with Jordan Nobbs being afforded a lot more space than the Welsh had given her. With some good build-up play forming, they worked a great opportunity for Christiansen but she turned her shot over the bar. With half an hour on the clock, they forced the Bosnian keeper, Envera Hasanbegović, into her first fine stop of the afternoon. Moore picked the ball up in space, 25 yards from goal, and took aim, forcing the goalkeeper to leap across to tip it away from nestling in the corner. Off the subsequent set piece, White drew her into another great stop as she tipped the header wide from point-blank range. With the first 45 drawing to a close, however, the tempo got slower and England struggled to create any meaningful chances. The match appeared to have been turned on its head at the beginning of the second half when Greenwood was sent off. Having been booked for taking a quick free kick in the first period, she went down in the area after a marauding run. To us in the stadium (and as the replays showed afterwards), it looked to be a penalty but the referee thought otherwise and showed her a second yellow for diving. With England down to ten, they could have easily lost their focus. However, they regrouped and kept up their waves of attack, finally finding the breakthrough 10 minutes later. With Beth Mead waiting to replace her on the side-lines, Lawley found a pinpoint cross. For once it fell to a white shirt in the area as Toni Duggan turned it home. Her celebration said it all! Mead made an immediate impact from the bench and a foul on her saw Bosnia-Herzegovina also go down to 10, with Amira Spahić receiving a second yellow card. England turned it up a notch again and Duggan was denied a brilliant second by the woodwork. White also forced Hasanbegović into another good stop. The second goal did come in injury time. Mead went on one of her direct runs that have caused so much trouble for defenders in the FAWSL this year. She was upended in the box and Taylor, on for Duggan, stepped up to convert the spot kick. With that the whistle blew, and England jumped above Wales to take up top spot in the race for qualification. It is easy to get down-hearted and frustrated when attack after attack breaks down in front of a defensive wall but Ellen White was pleased with how the Lionesses kept going and retained their focus when things did not go their way. “We knew we would have a lot of possession, a bit like the Wales game. But we needed to concentrate and not get too anxious if it was still 0-0. I think we scored at a good time and we were a bit more relaxed on the ball after that goal. England’s players and manager are aware of the need to figure out how to break defensive set ups down more efficiently. It has been something that the Lionesses have struggled with over the last few years. “To play against 10 players behind the ball is difficult and to be honest it’s something I think our team needs to improve going forward. But we got the win, we got the goals and that’s the important thing. On Friday night, Phil Neville had not been impressed with England’s first half performance. He appeared much happier at the end of the game and was pleased with the fact that they had managed to bounce back from their frustrations. “It’s difficult when you’re playing against teams like that. It’s almost like a training game because it’s attack vs defence and it’s attack, attack, attack. I think the most pleasing thing today was that, because of the frustration of Friday night, there could have been a psychological hangover where we were a little bit forceful, impatient and anxious to try and get that goal but I thought we played really well in the first half. At half time, I told them to be patient because 90 minutes is a long time. I knew that they [Bosnia-Herzegovina] were showing just signs before the break that they were becoming dead on their feet. Against these teams, the first goal is vital and the longer the game goes on, the more you get nervous. I just said to my staff in there, give me USA, France and Germany to play against any day of the week because it’s more enjoyable. But after the Wales draw, I wanted us to be top of the group today and we are and there’s a great spirit inside there. The last two games have been my biggest learning because ultimately when you’re setting up teams, you’re looking at both the defensive and attacking aspects of the opposition whereas probably in the last two games, we’ve just been looking at how we are going to score. That’s been a learning curve. I have also learnt that these World Cup games are a step up from SheBelieves. I thought the SheBelieves were probably the biggest games but ultimately the World Cup qualification matches are much more important because there’s 3 points on the line so that’s where that anxiousness comes in. The referee did not do herself or her trade any favours. Card happy and pernickety throughout, she lacked consistency in her decisions. She could have ruined the game for England with a very poor decision with the sending off. It was a harsh decision and means that Alex Greenwood won’t be available to play against Russia in June. For those who watch the women’s game regularly, this will not have been the first, nor will it be the last time, we witness such poor officiating. In games where something is at stake, you need a top calibre of official, male or female, to be in charge and step up. Until that happens, there will always be controversy and the refereeing will always lag behind the increasing standard of play. 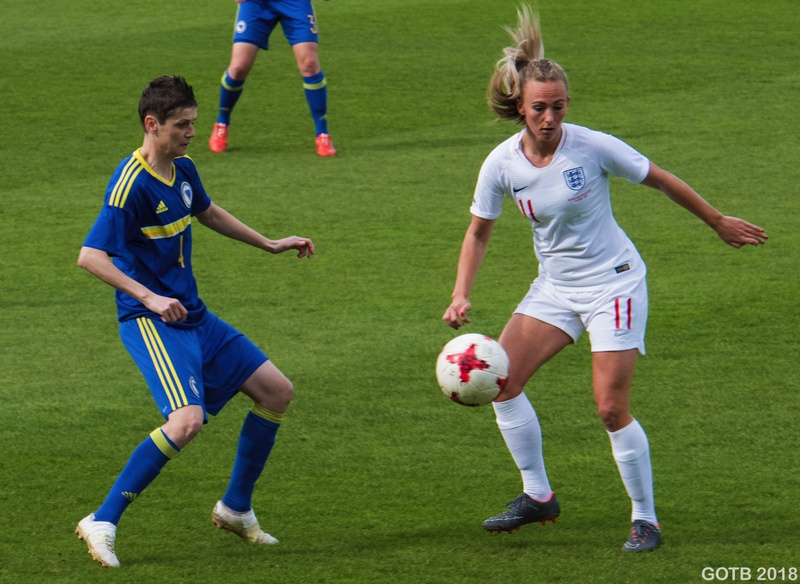 She has been a livewire across the last two games, put in strong performances and was the one who eventually broke the deadlock, but Toni Duggan is not resting on her laurels. It speaks everything about her as a player, the way she continuously expects more from herself and looks to improve. Tagged bosnia-herzegovina, england, England women, Fifa world cup, football, football blog, International football, lionesses, women's football, World Cup qualifier.